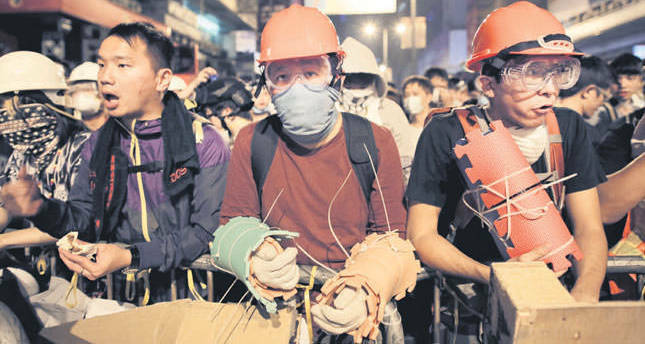 Daily Sabah: May we start with some brief information about what is going on in Hong Kong? What is this Umbrella Movement? Why are people occupying Hong Kong? Joseph Cheng: Hong Kong people have been demanding a democratic electoral system for all. The NPCSC in 2007 promised Hong Kong people that by 2017 they would be able to elect the chief executive through universal suffrage. So, the pro-democracy movement has been asking the government for a genuine democratic election system since the beginning of 2014. At the end of August this year, the NPCSC set a framework that does not give any space for a genuine democratic system. That is what triggered the "Occupy Central" campaign. According to this framework, the pro-Beijing elites would control the majority of seats of the nomination committee and the entire list of candidates of the chief executive election in 2017. Hong Kong's people feel that there will be no genuine competition in the election; that is the basic concern. But Hong Kong people, in fact, as you can see in the Occupy Central campaign, are worried about more than just this democratic electoral system. They feel that if they do not speak out today, they may not even have a chance tomorrow. They are also concerned about upholding their core values, their basic human rights, and dignity. They don't want Hong Kong to become just another big city in Mainland China. They want to maintain Hong Kong's spirit. DS: When Margaret Thatcher made the agreement with Deng Xiaoping, there was a condition that there would be universal suffrage in Hong Kong. JC: Chinese leaders agreed to this. DS: The tricky part is about the way universal suffrage seems to be understood; only candidates approved by Beijing could be nominated. JC: This is quite interesting because the Chinese authorities are saying universal suffrage is a big step forward. But, then you see there is universal suffrage in North Korea. Beijing uses the excuse of national security and demands the candidates be genuine patriots who love China to love Hong Kong. Who decides? The nomination committee? So, the Chinese authorities impose a political screening process through the pro-Beijing elites in the nomination committee. DS: The other concern is that the model of "one country, two systems" in Hong Kong and Beijing has also been approaching Taiwan, with some believing the same discourse can relieve them. Do you foresee any implications for Taiwan? JC: Chinese authorities promised Hong Kong people the one country, two systems model and a high degree of autonomy. Now, Hong Kong people feel that this high degree of autonomy has been diminishing. Its spirit, its prosperity, its innovations are very much based on this freedom. If Hong Kong becomes another Shanghai, Hong Kong would lose its vitality and Hong Kong's contributions to China would also be greatly reduced. There is a very serious concern in Taiwan too and they say "today's Hong Kong, tomorrow's Taiwan." Because, they are afraid that the tycoons in Taiwan may follow the example of the tycoons in Hong Kong as they sell out for the economic benefits. DS: The protesters seem to be quite determined. How long will this last? Do you think Beijing would interfere eventually? Do you expect the PLA to interfere as a last resort? JC: Regarding the Hong Kong people and the protesters, we had our glorious moments the week before last. There was the large gathering; almost 200,000 people. We had demonstrated to the world that we are not going to give up. By doing so, at least we can maintain our principals and our pride. Having said that, we also admit that we don't expect Beijing to meet our demands, that is the resignation of C. Y. Leung and the withdrawal of the decision of the NPCSC. That is why the idea is not to give up and it is a long-term political struggle. It is going to be a wave after wave; peaceful, non-violent civil disobedience campaign to demonstrate that this government is undemocratic and it is not representative. It is going to be very difficult, a very tough three to four years ahead. So, the pro-democracy legislators are going to engage in a civil disobedience campaign in the legislative council as well. The people have developed, accidentally, through experience, some kind of guerilla-war tactics. Yes, when the numbers are down, you can clear them away. But, they can always come back in the evening or tomorrow night or the day after tomorrow night. You clear Admiralty; they can go to another street or another district. This simply means that if you don't tackle this basic contradiction, if you don't respect people's basic rights this will go on. So, this is the big picture. In the short-term, obviously, protest activities cannot go on indefinitely. Honestly, we don't think they need tanks. I mean the PLA. Basically, there are two tactics: police clearance and the use of triads against us. So, by using these triads they can create incidents of violence. Finally, they can use the police. But, it is not important. If Occupy Central goes off, there would be others following. New Year's day we are going to have another rally. We, the organizers advise that when they attack you, when the police clear the area, go home and come back again. I am not talking about giving up. This is a long-term thing. There will be plenty of next times. PLA tanks are totally unnecessary for two main reasons: China today needs a good image in the world. The damage that image would incur by using tanks would be very severe. The second thing is that the threat is very small. You may occupy the whole of Hong Kong. The PLA can always block the border. And if they stop giving you water what can you do? You cannot affect Zhongnanhai. If you had 1 million people gathering in Tiananmen square, that is very different. They may lose power. So, we don't pose a threat to Beijing, we are not big enough. DS: What is the nature of the relationship between all these protesting groups? It seems that there is a division between Civic Passion and other mainstream groups. Why is there such division? You are trying to unite them. How and why would you unite them? JC: Well, I'd try to unite them mainly because we are already insufficient in strength. We need to be united in order to be able to persuade people to support us, in order to win the sympathy of the majority of Hong Kong's people. The divisions are mainly ideological. There are those groups like the Democratic Party, which have to talk to Beijing, the Hong Kong government and business communities. Then there are others who say let's forget about parliamentary politics, which is useless. Let's go to the streets. Besides, we are all fighting for leadership, for prestige. There is also a certain amount of distrust among young people and radical groups against the established pro-democracy political parties. These groups think that the pro-democracy parties always think about elections and their seats in the legislation. They are not pure. They don't care about elections and seats in legislation. They are more idealistic. So, there is this tension. DS: How about the communication among these groups? How do they decide on who will take part in the negotiations between the gov't and movements. Is there any kind of rivalry or disagreement? JC: These are a few of the main difficulties. But, basically all the other groups agree that the Federation of Students will decide. We and Occupy Central are not taking part. But, there was a bit of tension with Scholarism. They also want to take part. Yet, the big picture is okay.